Director of Legislative Affairs, Federation of American Societies for Experimental Biology (FASEB). Dr. Jennifer Zeitzer, Director of Legislative Affairs, FASEB, presented a workshop at the Institute of Neurobiology, January 31, 2014: From the Classroom to the Capitol: A Graduate Student’s Guide to Understanding Advocacy. 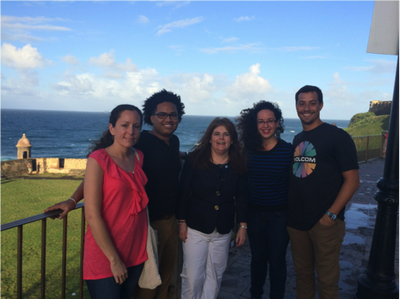 Sponsored by the students of the NSF CREST Puerto Rico Center for Environmental Neuroscience (PRCEN). Left to right, Noraida Martinez (Biology, UPR-RP), Jonathan Crooke (Anatomy and Neurobiology, UPR-Medical Sciences Campus), Dr. Jennifer Zeitzer, Mayra Sanchez (Environmental Science, UPR-RP) and Luis Colon (Anatomy and Neurobiology, UPR- Medical Sciences Campus). Travel to foreign countries to conduct neuroscience research next summer! Approved by the State Electoral Commission, case number CEE-SA-12-12162. This website is partially supported by the National Institute on Minority Health and Health Disparities of the National Institutes of Health under award number U54MD007600. The content of this website is solely the responsibility of the authors and does not necessarily represent the official views of the National Institutes of Health.